When trying to piece together your genealogy, genealogy maps provide a valuable resource for finding information. These old maps will provide information about land owners as to where their property was located. They also provide information about the local county seats that stored information about the county's citizens. Many maps contain other historic information other than the map itself. Most maps were commissioned by the county seat. The county's information was usually printed on the map along with the name and location of the town. Over the years, through growth and development, many townships changed their names and city limits. When researching their family lines, many people run into problems when the original names of locations have changed and there seems to be no records of the original names. These old historic maps have the original names of locations. Finding the names of places often help people make the connection from the name of their ancestor's town to the modern day town's name. Many historic maps can often lead information seekers to other sources of information such as old post offices, city directories and local libraries where county atlases are often located. When using maps to trace your family genealogy, be sure to get the maps that provide you with the best possible information. Start with the location where the relatives you are researching lived. Then find the most detailed maps of that region. 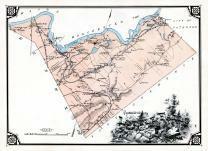 These maps will show the township in relation to where it is located within the county. With the information contained in the genealogy maps, you should be able to see the region where they lived and died. You may need to access other maps from following years to gather further information about the younger generations of relatives. By examining the landscape of the area presented by the maps, you can occasionally decipher what occupation your ancestors were involved in. Given the location of the family's home, you may be able to tell if they were farmers, merchants or traders. Once you have gathered information from local maps, you can take this information to other sources to further your investigation. Local libraries often have a vast amount of information about the history of the region. Armed with information, such as names and locations, obtained from the old maps, you can find more in-depth information by using birth, death and marriage records. Libraries also have copies of old news print on microfilm often offering even more information via obituaries and other articles. Beginning the process of researching your family's genealogy can be a daunting task. But if you utilize the historic information that is available, the task may not be that difficult. Access the local library and start your research with local maps. Old town maps are a great starting place for anyone that is attempting to find their heritage. No other source of information will be as helpful as genealogy maps when building your family's history.